This a compendium that lists the medical and magical properties of herbs and other plant materials. The author emphasizes the entwined dual usage of organic materials, and points out that although herbs are now referred to as “alternative” remedies; historically they were the only remedies available until the 20th century. Calling the first section an “introduction” is a misnomer, as much crucial information on understanding, wild-crafting, and purchasing herbs is contained in this section and shouldn’t be bypassed by the reader. There’s a list of basic tools and supplies to supplement herb-crafting. The first (unnumbered) chapter-section discusses herbs as medicine. The therapeutic action of herbs is compared to synthetic drugs. The author recommends using herbs for minor illnesses and injuries, and experimenting as results are noted. The lack of safety warnings on plants is explained, as is the potential for herbs to be hallucinogenic or deadly. The second chapter discusses herbs in magic. The initial discussion is followed by a list of ways of using herbs that is more medical than magical (and should have been placed in the previous chapter). The more therapeutic methods like teas, fomentations, tinctures, etc., are followed by more traditional herbal magic like sachets, poppets, baths, powders and inks. A suggested reading list follows the prose material. The foregoing information occupies all of thirty pages; the bulk of the book is the herbal compendium. Appendix A is the “Herbal Cheat Sheet” and gives the Common Names and Latin Binomial Names of herbs, plants and trees. Appendix B lists “Medicinal Uses.” Appendix C is “Magical Intentions,” Appendix D is “Herbs by Element,” and Appendix E is “Herbs by Planet.” Appendix F supplies a very brief, one-page summary of each herb in order of Latin names. Each herb has a list of medicinal and magical uses, the parts used, the element and planet associated with the herb, and notes about possible dangers below. The formatting of this book is bizarre! The introduction and the first two “chapters” squash a hodge-podge of information into thirty pages. Much is superficial and all of it is badly organized. The herbal compendium that is the main content of the book is organized into appendices, which are usually the little extra bits tagged onto the main body of a text. After the Herbal Cheat Sheet, the lists give the Latin Binomial names of the plants, an extremely frustrating feature unless the reader has memorized Appendix A; otherwise the reader is compelled to contend with laborious cross-referencing between various appendices. Very, very few people walk around rattling off Latin plant names, or would be at ease using these as the basis for a reference work! The individual plant listings are little more than index cards, and have no suggestions about usage other than noting illnesses and magical intentions assigned to the plant, and some scanty attributions. A further caveat is that there is no direct crediting of sources for the magical, elemental and planetary attributions. I suspect Martin swiped them from Scott Cunningham, but even so, there are major discrepancies between various authors on the Law of Correspondences and plants. These discrepancies are not discussed at all, and no alternatives are given on the individual plant listings. On the whole, Cunningham’s “Encyclopedia of Magical Herbs” is a much more useful, well-organized, well-written text for green witches to use as an herbal reference. 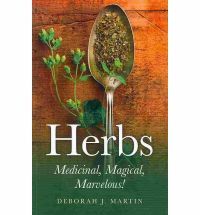 If the reader is looking for a book that describes how to use herbs for spell work with specific spells supplied, they would be advised to go elsewhere. Faintly recommended as a secondary herbal reference work for Latin plant names; this book will be more useful for a person with a strong background in botany or herbal pharmacology.